A submarine sandwich, also known as a sub, grinder, hero, hoagie, Italian sandwich, po' boy, wedge, zep, torpedo, bocadillo or roll, is a sandwich that consists of an oblong roll, often of Italian, Spanish bread or French bread, split lengthwise either into two pieces or opened in a "V" on one side, and filled with various meats, cheeses, vegetables, spices, and sauces (photo on the left). The sandwich has no apparent generic name, and major U.S. cities have their own names for it. The usage of the several terms varies regionally but not in any pattern, as they have been used variously by the people and enterprises who make and sell them. The terms submarine and sub are widespread and not assignable to any certain region, though many of the localized terms are clustered in the northeast United States, where the most Italian Americans live. The sandwich originated in several different Italian American communities in the Northeastern United States from the late 19th to mid 20th centuries. The popularity of this Italian-American cuisine has grown from its origins in Pennsylvania, New York, New Jersey, and Massachusetts to spread to most parts of the United States, and with the advent of chain restaurants, is now available in many parts of the world. 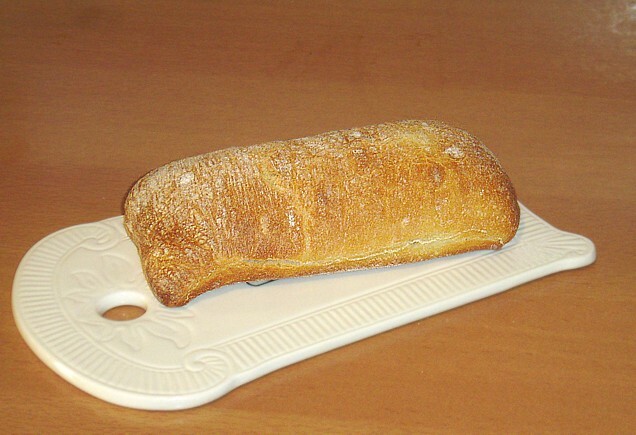 In Europe this would simply be known as a Baguette, or a Ciabatta, named after the type of bread being used. These types of bread are traditional breads in use in France, Italy and Spain for centuries. Left: An Italian Ciabatta roll. All varieties of this sandwich use an oblong bread roll as opposed to sliced bread. The traditional sandwich usually includes a variety of Italian luncheon meats such as dry Genoa salami, mortadella, thin sliced pepperoni, capicollo or prosciutto, and provolone cheese served with lettuce, tomato and onions seasoned with salt, pepper, oregano and olive oil. American bologna is sometimes used in place of mortadella and ham is often substituted for capicola, with prosciutto frequently omitted. Many locations that provide catering services also offer very large 3-foot and 6-foot "Giant" sandwiches. Crusty Italian breads are preferred for the hearty sandwiches. Grinders are sometimes made with toasted foccacia bread and melted mozzarella cheese. Both hot and cold sandwiches have been called "grinders", though the term usually refers to a baked or toasted sandwich. NY style Heroes usually have one meat. Tomatoes were not a historical ingredient of the hero, but are often included in today's heroes. Philadelphia-style hoagies should have bread that is crusty on the outside and soft on the inside. Hoagie rolls are never sliced in half, but are left with a generous "hinge" along the bottom of the roll. Quite often, much of the roll's inside will be removed to allow for the ingredients to fit. Hoagies often have more than one deli meat (never fish or chicken). Mustard and vinegar were not traditionally used in hoagies, and mayonnaise never is. The traditional dressing was olive oil. Other oils, possibly seasoned, or Italian dressing are sometimes used today. 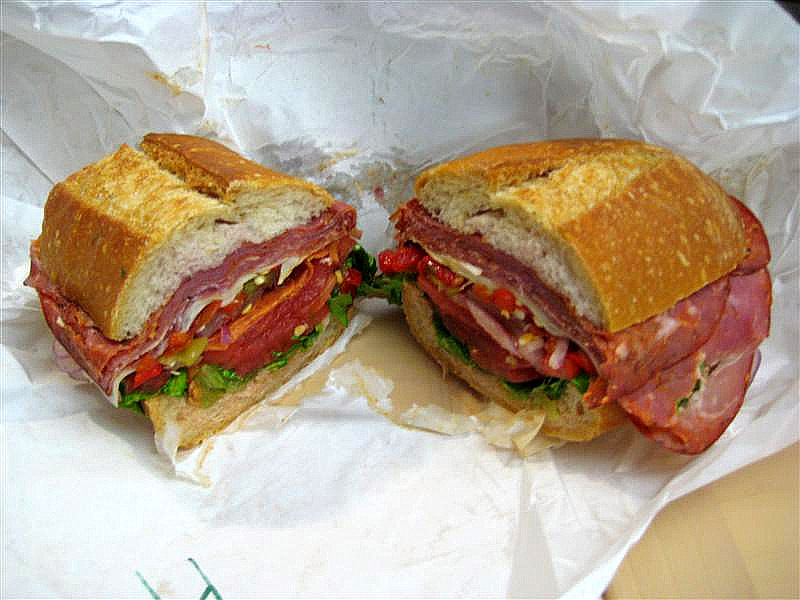 A standard zep contains only cooked salami and provolone as the meat and cheese, and includes no lettuce.